The Diet Detective: Is Chocolate Milk Good for Muscle Recovery? I have to say, the dairy industry spends lots of money convincing us that we need to drink milk, how important calcium is for strong bones, how milk can help us lose weight and, recently, how chocolate milk can help our muscles recover after strenuous exercise. In a 2006 study published in the International Journal of Sport Nutrition and Exercise Metabolism, researchers compared Gatorade, chocolate milk and a sports drink (with a carb and protein combination matching that of chocolate milk). Nine male cyclists biked until they were exhausted, rested and then biked again. The researchers had the cyclists repeat the cycle, but this time they drank one of the three drinks during their rest period. The cyclists who drank the chocolate milk were then able to bike significantly longer than those who drank the sports drink, and for about the same time as those who drank the Gatorade. The American College of Sports Medicine presented another chocolate milk study last year at its annual meeting in Seattle. That study, conducted at James Madison University, compared chocolate milk to a high-carbohydrate recovery beverage with the same number of calories. In this study, 13 male college soccer players trained for one week, then drank either low-fat chocolate milk or the high-carbohydrate recovery beverage after intense training for the next four days. They took a two-week break, then repeated the cycle, and the researchers compared the degree of muscle recovery between the two groups. According to this study, "All of the athletes increased their daily training times during the intensified training, regardless of post-exercise beverage, yet after two and four days of intensified training, chocolate milk drinkers had significantly lower levels of creatine kinase -- an indicator of muscle damage -- compared to when they drank the carbohydrate beverage. There were no differences between the two beverages in effects on soccer-specific performance tests, subjective ratings of muscle soreness, mental and physical fatigue and other measures of muscle strength." 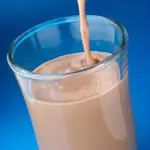 And yet another study, recently released at the American College of Sports Medicine's 57th annual meeting in Baltimore, showed that chocolate milk might be a "worthwhile post-exercise recovery beverage." According to Kristine Clark, Ph.D., R.D., director of Sports Nutrition at Pennsylvania State University, the milk industry has gone to extreme efforts to convince the public, especially athletes, that chocolate milk is the "one and done" product for athletes for muscle recovery. "And it's not," said Clark. "First and foremost, active individuals must ensure they are meeting their total energy intake needs in order to promote muscle recovery," said Jackie Maurer Abbot, Ph.D., a registered dietitian and board certified specialist in sports dietetics. "Next, they need to appropriately time consumption of adequate amounts of fluids and electrolytes, carbohydrate for replenishing glycogen storage, and high-quality protein for repairing and rebuilding muscle." She suggests drinking water for fluids, some Gatorade for the electrolytes such as potassium and sodium. You can see how much you need at www.gatorade.com/hydration/fluid_loss_calculator. Look for carbohydrates that are high on the glycemic index such as a baked potato or brown rice because they help move glucose into the cells. You also need good quality lean proteins.